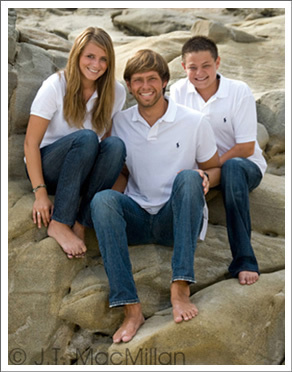 Family portraits are a specialty of J. T. MacMillan Photography, serving the San Diego and Coronado area. Family is your most precious gift and there is no keepsake more treasured than a great family photo. Trust J. T. MacMillan Photography to capture a family’s love and emotional bonds in a special location photo session. We create unique family portraits destined to become treasured heirlooms. J. T. MacMillan has been synonymous with exceptional portraiture for 20 years. Whether the portrait is of an individual, couples, kids, or a huge family reunion, we do it expertly and have a lot of fun along the way. In our experience, great portrait photography means capturing a family when they are relaxed, happy and at their playful best. Gone are the days when a family portrait meant dressing in formal clothing and sitting in a stuffy studio. We prefer to photograph families in a casual, natural environment such as a tide pool at sunset or a park setting where they can feel at ease. Our in-the-moment portraits capture the personalities of each family member and can even include your pets! No need to be camera-shy or self-conscious because J. T. MacMillan has tips to help you and your family look and feel their best on picture day. We work with each client to find the perfect concept, setting and lighting to create a unique, personalized work of art. Your images can be reproduced in black and white, color or sepia-toned on your choice of mounting surfaces – from canvas to bevel-edge or even brushed metal! Call us now to schedule the ultimate portrait experience!